NIGERIAN COUPLE, KENNETH AND FRANCA GBOGBOH have been identified as the brain behind the greatest welfare fraud of €400,000 in Ireland. They had been arrested and sent to various jail term of five years. This couple who reside in Kildare state had been jailed for two and three years sentence for what has been described as one of the largest welfare fraud cases in the State. Kenneth is 41 years, while Franca is 36 years old, but living in a world of crime. 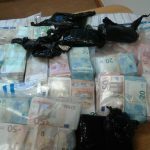 They are responsible for a combined fraud totals more than €400,000 and took place over a period of more than eight years. The couple arrived Ireland from Nigeria in 2006. Both applied for and began to receive unemployment benefit. Mr Gboboh then established a second identity under the name Patrick Akim and worked as an IT project manager using this name. He also took out a €240,000 mortgage from EBS in 2008 using the name Patrick Akim. During this time, his wife was continuing to claim jobseeker’s benefit and did not inform the Department of Social Protection that Mr Gboboh was in employment. After he bought the property at Willow Avenue, Primrose Gate, Celbridge in Co Kildare, Franca Gboboh applied to switch their rent allowance to the newly purchased house. Her husband filled out a tenancy agreement and signed it as Patrick Akim. Giving evidence at the sentencing hearing at Naas Circuit Court earlier today, investigating garda Tomás Burke said “the rent allowance granted by Irish State was effectively used to pay that rent under false pretenses”. Overall, Kenneth had fraudulently claimed more than €4,000 in jobseeker’s allowance and fraudulently obtained a mortgage of over €240,000. Franca Gboboh had claimed jobseeker’s allowance of more than €132,000 and rent allowance of almost €49,000. The court also heard that since the State stopped paying rent allowance the couple, who have four children have run up €40,000 in arrears on the mortgage. Judge Michael O’Shea was informed by defence counsel of a number of mitigating and personal factors in the case, in particular in the case of Franca. The court heard that investigating Franca discovered during their questioning that she could neither read nor write, and she claimed her husband had filled out all of the claim forms on her behalf. Garda Burke told the court that he believed it was Kenneth who was “directing and controlling” the fraud. A psychological assessment found the 41-year-old woman had a difficult upbringing in Nigeria and ranked in the bottom one percentile intellectually. The court was also told that the couple’s youngest child has autism. Justice O’Shea handed down a three-year sentence to Kenneth Gboboh, with the last 12 months suspended. In sentencing his wife, he acknowledged that she had been “under the control and influence of her husband”. And while he said children should not be “used as a shield”, he asked: “Can the children lose two parents in one day?” He sentenced her to three years for each of the 14 counts of fraud to run concurrently and suspended all three years.